We can offer A06B-6079-H206 on same day exchange service also in-house 24 hour repair and testing on this SVM2-40/40 Dual channel FANUC Servo Amplifier Module input 283-325 Volts (5.3kW) and has a maximum output voltage of 230 Volts. The single channel axis operates with a rated output current of 12.5 Amps on L axes and 12.5 Amps on the M axis. It can use both type A and type B interface selectable buy the JS1B & JV1B jumpers on the front. This A06B6079H206 drive uses the same power module and power card as the A06B-6096-H206 with different control board. Main FANUC PCB Boards inside are A20B-2100-0931 and A16B-2202-0772. As well as offering an of the shelf same day part exchange program we also repair, test and service this A06B-6079-H206 servo. 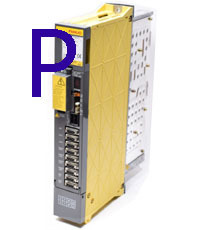 common faults we see are Fanuc Alarms IPML, HCM, 1, 4, 6, 9, 8, IPMLM, and Alarm 8. all our UK 24 hour repair service and testing is done under closed loop via Fanuc CNC Controls. but for speed go for our service exchange program.